What else does someone need to create a game? …Nothing else. For the needs of this first tutorial I have created a simple version of the game above. The astronaut can be navigated left or right through two in-game buttons or using the arrow keys if a keyboard is presented. In this downgraded version, the game is resized (not in the smart way as in the full version) but not rotated according to the orientation of the device (like it happens with the full version). These advanced behavior will be covered in the next tutorial (Level 2). that defines the background color (black) and disables the horizontal and vertical scrollbars of the browser. By calling startGame all values related with the size of the canvas are calculated. This take place inside the function initDimensions (line 511). The meaning of the assignment there is that the canvas-object will be as big as the entire window of the browser (lines 513 + 514). 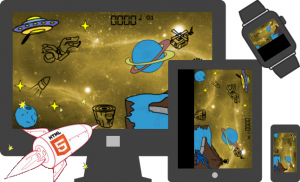 This tutorial is about games that use the entire window of the browser. Right after this point a context is extracted from the canvas-object with the option to support 2D-operations, since the game is a 2D game. 3D is also supported in HTML5. After these actions have been completed, the initContext() function at line 112 applies the previous calculated multiplicator on the previously instantiated context of the canvas. …but that doesn’t guarantee that after this line the image is loaded. For this reason, an ‘onload’ listener should be applied for single image so to specify the actions when finally the image is completely loaded. Since at any point of loading of resources it is known how many of them should be loaded, I increase a counter (iLoadedImages) every time an image is loaded and at time when the counter reaches the total amount of graphics (TOTAL_GRAPHICS_TO_LOAD) then and only then the initialization is indicated as complete and we can go to the next step. Once the contition if ( iLoadedImages == TOTAL_GRAPHICS_TO_LOAD ) is satisfied, the function initGameObjects(boolean) creates all ….game-objects (specifically implemented for this game) that use the recently loaded resources. When passing ‘true’ as argument (which is the case in the very first loading of the game) the function creates the yet undefined instances of these game-objects (line 133) since they were not existed before. The other choice is to call it with ‘false’ as it is the case in the startGame when only the positions of the already, previously instatiated game-objects should be rearranged (line 145). The function acts like the main game-loop since it is repeatedly executed by itself (line 604). In every single cycle of this loop the user’s input is checked by calling the function handleUserInput() (defined in line 316). It checks if the coordinates of a click on the screen are inside the two in-game buttons or if the left/right arrow-keys of a keyboard (if presented) has been pressed. The value of these coordinates is updated asynchronously through the listeners ‘mousedown’ (from a connected mouse, line 434), ‘touchstart’ (for mobile devices, line 451) and ‘keydown’ (line 476). Also there, the touch-coordinates are translated to the (perhaps) resized world of the game. Back now to the runGame( ) function. After handling the input of the user, the new positions are calculated by executing the function calculate_positions( ). This is where the logic of the game is implemented and the new positions for every actor or thing in the game is re-calculated. For the needs of this demo this function does absolute nothing, while the body of the same function in the full version of the game counts a few hundreds lines of source code. It is completely up to you to code there your own logic about how your game will interact with the player. At last, after this Odyssey we are ready to display the frame according to the newly calculated positions. This is performed at the end of our game-loop through the function onDrawFrame(), defined at line 526. There, the actual drawing on the screen take place. Now, that I spoke about these two cases, it is time to reveal the big secret: Both of these cases are in fact the same one. How different is to change the orientation (of a smartphone) than changing the dimensions of the browser? When a device is rotated then the new width of the browser is (almost) its previous height and similar with the new height. And since I discovered that it was not safe to rely on the indicator of the device that it has changed its orientation, this is why at the line 579, I decided to check if the (eventually) new dimensions are different than these of the previous frame and if they are, then the startGame function is called but this time with a ‘false’ argument, so that only a re-position of the elements follows (line 145, initGameObjects). In this case also the dimensions of the canvas are re-initialized and the new value of the scale factor is re-calculated. That’s all for this first part. Now, you have all information you need to look deeper into the code and get the knowledge from the source.